If you only get your Nats news from this blog (which means your decision making abilities should not be trusted) it was confirmed yesterday that Jayson Werth's wrist was broken. He'll need to be in a cast for basically June with a goal set now of getting back on the field in August. You might be ok with that seeing how Werth was hitting .208 / .294 / .287 before going down but the truth is the Nats need Werth. Or at least they need 2013 Jayson Werth, the guy who hit .292 / .394 / .455. It's nice that Span looks to be good again and Bryce has ascended directly into baseball heaven, but two bats don't make a team. Every other bat on the team was a question and "Will Jayson Werth return to form after injury?" now got an answer. No. Not this year at least. What are the Nats' options? The easiest thing, and probably smartest thing, would be to plug Michael Taylor into right left. 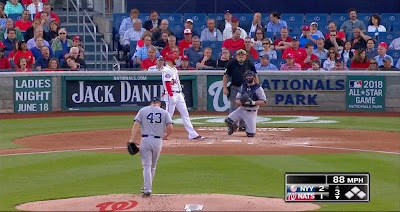 Putting offense aside, Taylor offers two things the other two immediate options, Clint Robinson and Tyler Moore, don't. He can field and he can run. That means if he doesn't hit (a distinct possibility given his absurd strikeout rates) he still gives you value. If Moore or Robinson don't hit (also distinct possibilities) they give you nothing. Just from a worth to the team alone the solution is obvious. If we take a macro view we get even more set on Taylor. He's 24 not 28 (Moore) or 30 (Robinson). He has 102 PA in the majors not 502 (Moore). He was killing it in AAA (ok they all did that which should totally tell you how much that actually matters, especially for older players). He's the likely CF replacement if the Nats let Denard Span walk, which was a given at the beginning of the year (I think now they might try to float him a 2 yr deal). Giving him an every day major league job makes sense. If he totally flames out - it's ok to move him back down and try to come up with something else. But he should be the everyday starter from now until say... the All-Star break. Something like that. Moore and Robinson, as noted, are the other options and aren't very appealing. They may hit a little better than Taylor. Moore would almost certainly give more pop. But they will likely hit for very low average with little patience and frankly can't field or run. They are questionable bench guys, forget starting. McLouth, the original OF depth, is still out from shoulder surgery. denDekker, who they traded Blevins for to get more OF depth, can't hit even in AAA. Difo is an IF who doesn't have any compelling reason to leapfrog Taylor. The minors are a mess. How bad is it? The best hitter playing OF in Syracuse is hitting .241 / .343 / .345 and is 26. The Nats literally have no OF in their system that you'd consider a prospect with Goodwin floundering and the very fringey Rafeal Bautista first struggling in High A and then getting injured. A trade? Possible but there doesn't seem to be a need for it now, with Taylor available. You wanted him to play OF next year so dealing for what essentially is a 4 month rental is risky business unless you can get someone for a steal. I'd explore this path, you know kick the tires on some guys, but only to get a feel for a deal that you may have to make in 6 weeks, not to do anything right now. The other side of the injury is what this means for Werth going forward and it's likely not good. He did recover in the past from a wrist injury but he was a relative pup of 32 going on 33 when that happened. He's 36 now. Even then it took a whole season of playing to regain his power (it was June 2013 when he started to hit like normal), meaning that if he comes back in August the likely scenario is that he won't have any significant pop until next year's stretch run, or more likely 2017. What does it mean for Werth's "legacy"? Well subjectively the fans will still probably look at him positively. They like him and he did well enough in the past 3 season, when the Nats were winning, that they associated him with it. Objectively it's going to be hard to say that contract is a winner, given that it likely produced something like 2 1/2 good seasons in 7 years. Then again Werth surprised me once turning what looked like a sure bust in mid 2011 to a maybe winner by the end of 2014. Perhaps he can do it again. And even if he can't pull out a good regular season in the next couple years (spoiler alert : he can't) he could still deliver big hits in a playoff and getting the Nats into a WS or winning one, well that's worth a lot in itself. Like I said, we can't deliver judgment until it's all over and that's over 2 years from now. On May 9th (Hey!) Bryce completed his 6 homers in 3 games streak. He bumped his season total from 5 to 11 and was technically on a pace then for 57-58 homers. Ha ha. 58 homers! What is this, the roid era? He'll hit a bunch, sure, but it'll slow down. In his next 16 games he has hit 7 more home runs, increasing his pace to 62 homers for the season. OK Hmmm. Hmmm. I was totally wrong on this. We could very well be witnessing some history in the making here. Let's have some fun with pacing. If he hits HRs like he has the season so far (18HR/47g pace) he'll hit 62. Dammit not 100. He'll have to pick up the pace to do that. Remember the Bryce/Trout post from a couple weeks ago? Two of those goals I put out there were monthly goals. Ten homers? Bryce has busted way past that with 13. .500 OBP? Bryce is on that now, with the opportunity to pass with three hot games. How good exactly has his month been? I checked to see how many times in baseball history someone posted a OPS of 1.400 or higher in a month (while playing at least 22 games - I don't know why 22, seemed right, this is all arbitrary anyway). How many times? 53. You might think that's alot. Then you realize each player has 6 months that they can play around 22 games. The Nats in 2015 alone would account for say 40 chances at least. Then expand it to all 30 teams. Then expand it to 100 something years. That's a lot of potential months that haven't been this good. Bryce has 18 HRs, 41 runs, 43 RBI, and 42 BBs right now. I don't have to tell you where those rank in the majors (first or tied for). He'd rank 4th, t6th, 6th, and 6th on last years team. That was a decent offense for a team that won 96 games. Right now if he stopped he'd already lead the 2008 team in home runs. By four. If he played the rest of this season like last year - which he hit .273 and had his worst power numbers of his career he would end the season hitting .290 with 33 homers. This is a fun. Bryce is fun. *There are a few "that guy?" names on the list but generally they have half a month of PAs or less. Basically it's a hot two weeks and if I looked at it that way I bet we'd find a ton of guys with two weeks just as good. There is only one guy on the list with a full month of at bats you'd blink an eye at. Richard Hidalgo had a MONSTER end to the 2000 season. Who shut off the offense? The first thing I'll note is that the Nats offense has not been consistent. It's been streaky. It's an odd coincidence but the Nats have followed 20 game patterns offensively so far. In their first 20 games they scored 69 runs or 3.45 per game. For a season that would put the Nats at... 14th in the NL a step behind the 14th place Mets but well ahead of the 15th place Phillies. No wonder they went 7-13 during this time. Game 21 started the recent winning streak and the Nats in the next 20 games would score 133 runs. That's almost double for an amazing 6.65 runs per game. Game 41 begins the streak I noted above - it's early but 2.2 runs per game if you are interested. The 6.65 is not an impossible number given the entire history of baseball but in recent years, in these offensive conditions it would be close to that (it's around a game above even the steroid era, no humidor Rockies), whereas the 3.45 is poor but far from unprecedented. This tells you the high scoring run streak is more of an outlier than the low scoring run. Fine. The Nats won't score 6.5 runs a game. They won't even score 5.5 runs a game. But they don't need to. They are at 4.7 for the year now. 4.5 will likely be Top 3 in the NL. Can they do that? Looking quickly (stuff to make up for this Memorial Day week) I'm not sure. Bryce and Denard should both take steps back but that's going down from guys whose hot streaks were big reasons for the 6.5+ runs a game. Bryce will slow but could easily end up around the best Miggy seasons (near 200 OPS+). Denard won't stay on a 30 homer pace but .300+ again with a bit more pop is possible. Those are guys that can be keys to a Top 3 offense. The rest of the offense gives pause. The next two best offensively are Danny and Yuney. Danny is beginning to drift back to old Danny. His K rate is up over 30% the past week. There's potential here for a breakdown if it keeps up, but even in the past week he's been Danny. If you twisted my arm I'd say lower average still with patience and pop. Pre-injury "old Danny" not post-injury "old Danny" which means about league average type. Yuney I've never liked and the .315 average is hard to buy into. If he doesn't keep his average up, he's not useful at the plate. He was hitting well but has lucked into more hits as the season progressed to keep the average up. (.350 BABIP). It's going to be dicey if he can keep around average. And that's it for the above average starters. Now we see trouble. If Bryce and Denard and Danny and Yuney all step back (all reasonable guesses - remember a step back for Bryce is still arguably best in decade type season) that's fine. Remember we are coming down from the top of a mountain. Even minor corrections from the rest of the line-up should keep the Nats atop the NL East. Unfortunately the best offense in May after these guys has come from the likes of Uggla and Moore. Guys you don't expect to play or keep up that level of offense if they do. Can't adjust those up. Ramos hit better during the stretch but is struggly mightily recently. I don't see a reason to think he'll be any better than the overall slightly below average we see now. I like Zimm, I think he can do better, but the past week is just dragging him down again after a moderately better May. Michael Taylor is still adjusting, is not hitting, and can't be trusted to. That leaves the best bet for offense currently healthy as Ian Desmond. It hasn't been a great year for Ian and he's definitely trending down career-wise (those K's are going up and up) but his power is real, has room to return to normal, and there's no injury concerns here. After him its Werth coming back to replace Taylor, which may or may not be better giving how he looked so far, and Rendon coming back which may actually push out Danny, who as I noted above I kind of like to keep up average offense, for Yuney who I kind of don't. There isn't anyone out there that I think - oh yeah this guy is going to pick things up. I don't know how I feel overall. I know I don't like the Nats to be best in the NL. The only reason they sit there now is because of an insane 20 game run pushed by an insane month by Bryce. But Top 5... Let's look at it another way. They were Top 3 last year, Werth was very good, and Rendon and LaRoche were right behind him. Span, Bryce, Desmond and Zimm (when playing) were all good. This year Bryce could be great and Span should be good and... and... I don't know. There's all those injury returns. If Desmond gets good like I think he could and Espy plays and stays around average and Werth/Zimm are around average and Rendon is back and good... yeah Top 3 is there. If Desmond stays below average and Rendon who struggles, pushes out Danny while Yuney drops below average and Werth/Zimm never get it going... they could drop to something probably right around average. It would be a team carried by Bryce and yeah I'll say it, Span. There isn't anything here to worry about playoff wise. Max looks great. ZNN looks very good. Enough of the pen is decent. There shouldn't be an absolute hole in the offense just dips. At absolute worst what are we talking about, average pitching and average offense? A .500 type team? .500 from here on out is still playoffs. And that's absolute worst. I don't know what I'm saying here other than the offensive discussions we had during the offseason still hold. Is this a top offense or not? We don't know. We know Bryce can literally put the team on his back. With just a couple of other guys hitting well he can help carry the team to record type offensive production. Bryce Harper's ascendance pretty much assures to me this offense won't be a below average one. So where will it fall from say 1-9? That I still don't know. I'd bet not 1 or 2 but anything else I think is still in play. There are too many questions for me to feel good about saying anything else. Is it premature to call the NL East for the Nats? Yes. Am I doing it? Yes. Well more accurately I'm saying right now that if the Nats and Mets rosters don't significantly change the Nats will win the division. The Nats have expanded their lead to 2.5 games. While they keep playing well and catching breaks (two more one-run wins over the weekend), the Mets don't have the offensive players to keep up with the Nats (it's almost like they had to make one additional off-season move after getting Cuddyer. Strange that no one ever thought of or mentioned that). Is it silly to say in May "if the rosters don't significantly change"? Yes, one more time. But it highlights the talent gap that is apparent now. We saw that gap to start the season (which is why we all had the Nats winning the East by 8-10 games or so) but at the beginning of the season there are the lingering "what will happen really when we get going?" questions. We've gotten going now. There isn't likely to be a surprise flop or breakout anymore. We see Strasbrug, Gio, platoon Danny, Bryce breakout and we can account for all that. We see Plawecki, not Wright, Familia and we can account for that. Unless we see a huge trade or injury I don't see the Nats losing their grip on first. Strasburg is hurt. That's what I said. That's what I believe. Here are your options. 1) Strasburg was always bad! 2) Strasburg is a head case! 3) Strasburg is injured. #1 is the intelligent design of arguments. Nothing backs it up. #2 is fun but this would be the first time I ever saw a guy being not right in the head proven by a lack of bite in the curve and a fastball missing by a few inches. #3 isn't backed up by anything either if you believe the Nats doctors but why would you do that? Where is Rendon now? Didn't they say Danny didn't need surgery - only rest? I suppose that is true but I think you'd usually bite on the surgery if the "rest period" turns out to be almost 3 years. And beyond that who am I supposed to believe? Bloggers looking at video and data points and making (slightly) educated guesses? Uhhhh, no. That's not statistics, that's witchcraft. He's pitching worse than he ever has by far. I'm sticking with injury. Please don't declare a trade or contract a winner/loser before it is complete. Even the Fister deal, which was apparently a very good starter for three AAAA pieces, I wouldn't call right now. The Werth deal, still two seasons from completion, is still up in the air. You have to see how the whole thing, WHOLE thing, plays out and then make a judgment. Does that mean maybe waiting a decade? Yeah, yeah it does. Don't use D stats for anything but "it looks like" talk. This is for both good and bad views. I don't know how we all got to this point. It was pretty clear a year or so ago that defensive stats were questionable to the point it was recommended you kind of use a rolling 3 year average to get a better feel for the abilities of a player. Then it was pointed out that that made WAR very flawed as a single season measure and so the response was "I guess it's ok to use defensive stats for a season, then". It feels like when push came to shove the people pushing these stats were more interested in protecting the stat then standing by the work. I guess they feel that eventually with all the data someone will come up soon with a good way of measuring annual defense and therefore if they hole up, protect the stat, and ride out the storm, that they'll emerge on the other side with the same level of influence? I don't know. I'm digressing. It'll be nice to look at the team over the next 4 months and see the good performances shine. But understand that for probably I'd say 75%-80% of the fanbase what really matters is how they perform in October. Harsh but true. I've said it before but if they win 105 games and Storen saves 55 and then they lose in the NLDS and Storen blows a game, that's not ok! They failed! It doesn't mean they are a bad team or that they are bad players, but it does mean that they started the season with a goal and they did not achieve that. And that matters! A lot! Especially this season because next season (no ZNN, no Desmond, no Thornton, no Fister?, no Span?) begins the 2-season exodus that will reshape the team. It may not be as sure a winner when we wake up on Opening Day 2017. The time is now, not to have a really good season, but to win in the playoffs. OK so here goes. 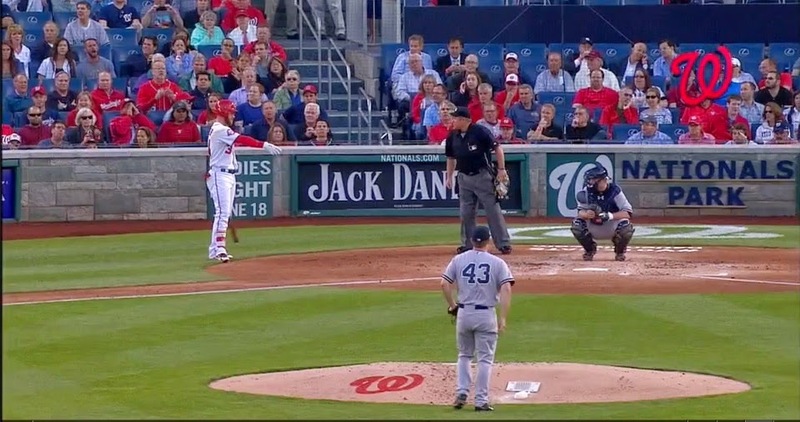 Bryce takes a pitch low that gets called a strike. Bad call. Bryce chirps at the ump about it (by his own admittance he said he did this). Then he steps well out of the batters box. Definitely showing displeasure here. Bryce points to place he says he was standing. The ump was still facing the same direction at this point so it appears he was still arguing with Williams and Bryce was reacting to something said. Most likely it was "He was outta the box!" "He was in the box!" "He was outta the box!" Bryce is saying "Hey no, I was right there." The ump now faces Bryce and they twice have the same discussion with both the ump and Bryce pointing toward the box. Finally Bryce comes over and with his foot shows the ump where he was standings and the ump runs him. There's a lot you can say against the ump and manager. 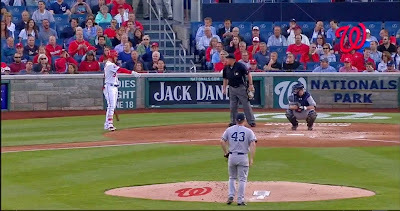 The ump didn't have to keep chirping at Bryce to begin with, or engage Williams, or engage Bryce. Williams didn't have to insert himself into this. But I kind of see both of those. The ump chirping is typical baseball just like Bryce's first chirping. It happens you have a back and forth and then the bat goes on. Williams interjects because he's looking especially at watching Bryce's back. The ump goes after the bench because he was just telling the player not to do this and now the bench is doing this. He argues with Bryce because at this point what the hell is going on. I'm very confused at Bryce's actions. Not the initial chirping. Like I said that's very typical. If the ump were to eject players every time that happened you'd lose a handful a game. Bryce was just letting off steam like ball players do. But why did he feel the need to interject himself into the bench vs ump argument? And even more strange why was he so adamant he was in the box when he was so clearly wasn't? Even in the post-game while the ump and Williams both implied Bryce was out of the box after that strike, Bryce implies he never did step out. But he did. I don't get the sense he's purposely lying. I kind of think he really did think he had a foot in the box the entire time. But he so clearly didn't that the ump felt like this kid was mocking him or something. I don't know. As a twitter follower of mine (Steven Maguire) said it's a shame that because not one of three guys could cool it that Bryce had to be thrown out. The Nats have gone 9-1 in their past 10 1 and 2 run games. The entire history of baseball has shown us that these types of games are basically coin flips. You might think a great pen or clutch hitting would skew these numbers but they don't. A bad team with a bad pen might do better in one run games than a division winner with the best pen ever. (For example last years Royals were 22-25 in one-run games) The Nats are catching breaks here too. None of the above is to suggest the Nats aren't the best team in the NL East (they are) or aren't possibly the best team in the NL or MLB. I'm just highlighting what it takes to have a 17-4 type run. It's not enough to be good. A good team goes 12-9 or 13-8 in 21 games. Those are 93-100 win paces. To get to 17-4, a team has to be lucky too. There are no teams simply good enough to win 132 games (the pace the Nats have been on). You have to be lucky. But that doesn't mean it will eventually turn on you. All that means is it will eventually trend back to normal. The Nats had a mildly unlucky start followed by a lucky run just as long. The end result is finding themselves about where they should have been with just normal luck from the start. A roller coaster ride instead of the gentle ascent. After that start you'd have thought it would take 40-50 games to get back into first (if they went 13-8 like I noted a 100 win team would be around they'd still be 3 games out right now). Instead, they got here in 20. Consider it a shortcut back home. Now they have a chance to put the Mets in the rearview with a sweepable series vs the Phillies while the Mets finish up vs STL and go to Pittsburgh. After that the Mets have a easier time but if the Nats can put 3-4 games between them and New York by the time Monday rolls around... I don't see the Mets making that up, easier schedule or not. There's no luck necessary at this point. Just do what you should do - have the Mets do what they should do and this brief interlude may all take care of itself in a matter of days, not months. They were pretty simple instructions Nats. Gio was on board with it. Perhaps Nate Eovaldi was just so bad you couldn't avoid getting hits. This is what we get pulling guys from the dregs of the NL East. "We got an NL East starter!" "Well that's ok. The Braves aren't quite as stacked but have a lot of young talent." "The Mets traded cross town? Sandy Alderson is getting bold." "Oh that's right! How could I forget Hamels?" "What's left? Someone like Tom Koehler or Nate Eovaldi?! Haha! I mean come on." ZNN is here and there, but Adam Warren is nothing special, so tonight really it depends on the ZNN that shows up. Anyway the Nats are back in first. Some people are taking this as a triumph of sorts. To me it's like the Nats wasted 40 games. If you assume the Mets are the only true challenger to the Nats (and that seems the most generous view of the NL East, arguably the worst division in baseball) then Nats record compared to the Mets one is the only one that matters. They are tied a quarter of the season in, the season starts anew. Do I like the Nats position? I think you have to. If you liked the Nats by 10 to start the year, and nothing has changed, you like them by 7-8 from here on out. I liked them for the season, so I like them for 3/4 of the season. I'd like them for 1/2 the season, or a month, or even a 10 game stretch no questions asked. (When you get down to just a couple series then you have to look at match-ups more closely) The more games, the more likely it is the Nats talent advantage will shine through. 122 games is not 162, but it's plenty. Some may say you shouldn't have been worried. They're wrong. The Nats were one bad stretch (which will happen at some point) and one great Mets stretch (maybe won't happen but as we saw not impossible) from being in real trouble. Like panic time, trouble. It wasn't likely that both those things would essentially happen back to back to start the year but like flipping a coin heads 10 times in a row - it becomes a lot more likely if I tell you you've already done it 5 times. The Nats wasted away their cushion. Now they've built it back. The worry state officially ended... I'd say about a week ago. Pulling within 3 games kept a bad series/good series combo from putting the Nats 6+ out*. It's not quite hammock time but I'd feel good right now. All the Nats have to do right now is avoid injury... well any more injuries. The team could absorb one OF injury with Taylor in the wings, one SP injury with Roark in the swingman role (nicks and dings have meant so far they've only needed spot starts) and maybe one IF injury with Espinosa (though no one expected him to hit this well). They've kind of gotten all of those, so they are on the edge. Will they get healthy before going over? That's the question. It's not a cliff's edge, it's a step's edge but it's there. You know what - really just keep Bryce and Max in bubble wrap between games and they'll probably make the playoffs one way or another. Lose big. Lose small. Lose early. Lose late. However you want to do it. Just lose. This isn't personal. It's just that when the Yankees are involved there is one team of good guys and 28 others and one team of bad guys. For the next two days the Nats are just one of those 28. Did you know Gio's last game was hot garbage? It's true! You can't trust that guy. Zimm (.235 / .286 / .235) and Ramos (.273 / .308 / .273) have both cooled way down! Desmond and Escobar have similar blah numbers the past week. Danny is crushing lefties that is true. Which hand does Eovaldi throw with again? Oh yeah the right one. Werth has been hot, and he's not playing (Booo Nats for real though - for taking away my chance to heartily root against Werth). Bryce? Ummm... we'll pitch around that guy, between talks with Scott Boras on what small island he'd like the Yankees to give him in a few years. 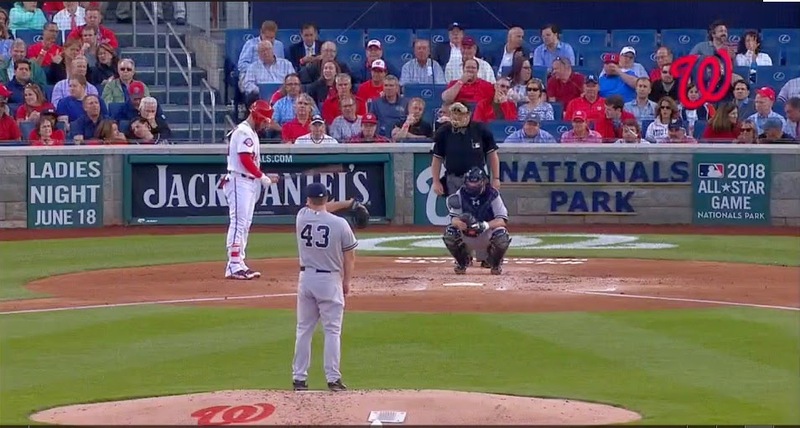 Here are some potential terrible HR calls from John Sterling for when Bryce joins the Yankees. "Bryce crushes it over the canyon!" "I don't want to harp on it, but it's another home run for Bryce!" "Isn't it nice, another homer for Bryce!" There is a scary thought lurking behind the transformation of Bryce into BRYCE. That's the gamble that the team was laboring under on Opening Day. If Bryce hadn't started fulfilling his full potential at this instant, a completely reasonable assumption given he hadn't yet and is 22 coming off injury, where would the Nats be? Other performances have helped the Nats but were more predictable. One of those starters was sure to be great right? Someone would hit (though if you told me it would be Espinosa/Escobar...) but Bryce becoming the most feared hitter in the NL? Better yes, but instantaneous reaching of peak potential, no, that wasn't on the radar. And without it the Nats would likely be around .500 wondering why they can't piece everything together. But that's a scary alternate dimension thought because here in Dimension @09ia... I mean here in the only current reality that exists there definitely aren't other ones I travel through, Bryce is BRYCE and the Nats are right on the Mets heels. If you don't read the comments someone asked what I thought was going to be the future of the division race and the way I see it has the Nats taking the lead soon, losing it again, then having a back and forth before finally pulling away around the 4th. That might be optimistic for the Mets, but I like their schedule and they are due for some luck to turn... well back even at least. So there you go. Can you wait... 6 weeks? The big question with Bryce is what happens when teams stop pitching to him. Williams would almost certainly use Werth or Zimm or even Desmond to back him up and that right now is garbage, meh, and poor. Will they pick it up? Of course "when they start giving us free baserunners..." is a good way to start any problem question. Strasburg looked ok yesterday so maybe he isn't hurt and as it was suggested maybe he's having some sort of post-injury recovery issues putting himself back in form? We'll see. San Diego is basically home. When Bryce Harper was called up in 2012 there was a a big kerfuffle among his supporters and his detractors on how he compared to this young phenom for the Angles named Mike Trout. Bryce backers kept noting that Mike Trout had played 40 games prior to 2012 (plus had the beginning of the year while Bryce was in the minors). They also noted the age difference as Trout was actually on the way to turning 21 while Bryce would be 19 all season. Basically they were grasping for any explanation how their phenom could end up playing second fiddle to this other one. Mike Trout would end up hitting .300+ with 30 HRs and stealing 50 bases while Bryce was heading toward .274 20 and 11. They kept it up the following year but after Bryce basically matched his numbers and Trout traded some steals for a lot of walks the fight was over. Mike Trout was the better player. It's still early and things will still swing but if Bryce can keep this up this comparison will finally be something it never was before, reasonable to make. Would you want the all around player - above average at everything, or the dominant offensive presence who frankly isn't really bad at anything? That's a fun argument to have. Trout guys may try to tell you Bryce's numbers are definitely going to fade. Yes the HR/FB rate of 32.4% will drop, but how far? The .347 BABIP might indicate some luck (though he was at .352 last year) but he is hitting everything hard, making great contact (in the zone contact % best of his career), swinging and missing less than he ever has, and identifying strikes and balls better than he ever has (or ever has tried to) before. There's a dip in homers coming. Everything else? I can't be so sure. If Bryce keeps this up, hell even if the SLG drops .100 pts because of the expected HR rate slowdown, he'll have a better age 22 year than Mike Trout did in his 22-23 year, and that's not taking into account the ever disappearing offense for the sport as a whole. Trout has never hit this well (OPS 1.100+) this late into a season. Bryce is forging his own path. That's not saying Trout hasn't set lofty goals. He's hit over .325 for a season. Hit 36 homers in a year, drove in 111 guys, almost hit 40 doubles. He's carried a 1.000+ OPS into late September (2013). He hit 10 homers in a month (July 2012). He got on base half his PAs in a month (August 2013). That's impressive considering he's been in the majors all of 3 full seasons. But he's never hit like Bryce is now, on pace for 14 homers and 32 RBI in May. That pace is silly but I'm just saying. I'm not sure Bryce will every top the average (that's not really how I see Bryce) but everything else? That's in play, that's in play right now. Let's make this a bar argument worth having. Other than you should not have sing-alongs to the Dave Matthews Band lest you tempt my wrath. 1) Gio Gonzalez is also having non-ignorable problems. Hidden behind the "There's something wrong with Strasburg" and "Where did ZNN's fastball go?" lies "Gio is having problems, too.". Stras' issues seem fixable to some degree because Stras in likely injured (in my mind at least). ZNN's you can sort of wash your hands at because he is almost certainly gone next year. But Gio? Gio is a guy you were hoping to have on the cheap through 2018 and his problems seem like the dreaded "steady decline". His WHIP is way up - part of that is BABIP (now .387, isn't going to last) as I noted a couple days ago - but part of that is how he's pitching now. He used to be a FB guy. If you can get them to hit flyballs but not homers (and Gio has done that since 2010) you get a lot of outs. This year he's given up way more GBs (58.2% when his career average is 47.1%). GBs go for hits more often than flyballs. Strikeouts are a bit down, walks a bit up. Maybe he's going through a mid-career conversion to a crafty lefty... but I doubt it. Crafty lefties tend to have great control. That's not Gio. I'm not crying DOOM here but part of the "dominant Nats scenario" was having 5 starters who would be another teams #1 or #2. The original three are all failing at that right now and given Gio and Stras' importance for the next few years, there's a lot of pressure on the now. 2) It's nice to have an actually good 4th OF. Remember when they sent down Michael Taylor because Mike Rizzo loves the vete.... I mean Taylor needed daily at bats? Yeah that was stupid. We said it then, I say it now, Taylor belongs in the majors spot starting, covering for Werth on D late in games, and otherwise filling in for the Nats OF crew. He's a possible starter now, which means he's the perfect fourth outfielder on a team that fancies itself a championship favorite. Or do you still favor Clint Robinson (.205 / .244 / .282), Reed Johnson (.222 / .263 / .278), or Tyler Moore (.207 / .281 / .448)*? 3) They may be stretching out Roark. He was a late inning guy for a few weeks and seemed to be getting the hang of it. Yesterday they had him throw almost 2 full innings. My gut says they expect Stras to land on the DL and Roark will take his place. Of course as we talked about before that leaves a late inning hole in the pen. The Nats tried to fill it with Barrett. Didn't work. They don't have another dominant arm in the pen so we're looking at musical chairs if what we think is going to happen happens. It won't be pretty but hopefully the Nats can keep up the decent offense and make late inning hiccups nothing to worry about. 4) The Nats are almost over the hump. The Mets lead is down to 1.5 games. They've played poorly (but not like an exact inverse of their start) and the Nats have played great. But here comes the real test. The Mets play 8 games versus teams currently over .500 over the next rough month. The Nats play 15. It's probably true that Pittsburgh (who the Mets play but Nats don't) is better than their .500 record, but it's also probably true that SF (ditto) is probably worse - giving the Mets some more easy games. MIL, PHI, MIA (imo), ARI, SFG are all should win series for the Mets. PHI and maybe TOR are should win series for the Nats. In turn if the Nats lose a lot of ground, well then it will doubtfully be enough to panic (one of these two teams would have to go on a 10-0/0-10 ish run to do that), but it will likely make the climb season long. *Yes Tyler Moore hit a home run. Anyone who's read this blog for a couple weeks knows I don't like Tyler Moore. But if you've read it for at least a few months you know I admit that he will probably hit some homers if you give him enough at bats. But he brings nothing else to the table. He is not patient. He will not hit for average. He does not run well. He does not field well. 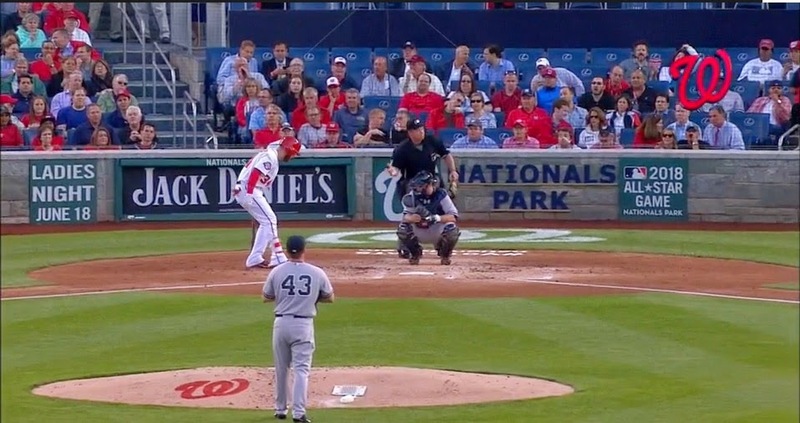 The Nats are good but they cannot afford such a one-dimensional player on the team. Really they need to complement Michael Taylor and since he can field, run, hit for decent enough average and power - they need a patient bat or a contact bat. Preferably lefty. Again this is not Moore, not close. Some people will tell you Strasburg was never very good and always wilted in pressure situations. This is wrong. This is demonstrably wrong. I still strongly advocate the classic debate rebuttal tactic of face-punching when it comes to these people. If that fails, continue with the tactic as it will at least stop them from speaking more idiocy into the air. However being good in the past is worth all of nothing. Right now we care about... well right now and Strasburg is not good right now. This was a particularly bad outing, to be sure. Atypical of what I think he'd put up the next time out. But he's only had one good game so far (7.1 IP 1ER 5 H 7K 2BB affair vs the Phillies) and one decent one (5.1 IP 2ER 6H 7 K 1 BB) the other five have ranged from disappointing to last night. Strasburg is pitching worse than he has ever pitched, not by a little, by leaps and bounds. Why? Well you can argue declining fastball speed I guess (down to 94.4 from 95.7 in 2012) but that's usually not an issue until a pitcher gets much closer to 90MPH. You could argue the movement of his pitches, but there doesn't seem to be any appreciable difference in them statistically (though there is a lot more that goes into that than just movement numbers so I claim nothing here other than "it's not obviously this") Even if it was one or the other it could still be the most likely culprit in my eyes. Injury. If it is injury it would be a delightful litmus test showing how fans irrationally don't like Strasburg. He's been hurt. He hasn't really said anything to the media to make excuses. He's tried to pitch through it. That's gritty! (and stupid - but it also takes a stupid team to bring it to fruition) and yet I bet if that's the case you won't hear any "I like his heart for trying!" Instead you'll hear "oh he's a head case because he couldn't pitch through it" or "he's too fragile" or some junk like that. Those that don't like Strasburg cannot be satisfied, hypocrisy be damned. But that's just me railing, really the most important thing is what happens if he is injured and does go on the DL. The Nats can roll the dice with AJ Cole but he does not seem ready. Stretch out Roark? Sure, he's looked good, but that'll take time and what happens to the pen? Taylor Jordan? I suppose. Either way they aren't going to be 2012-2014 Strasburg. BABIP - while an exception might inexplicably keep it up for a year (I'm looking at you '13 Chris Johnson) generally a BABIP over .360 is reserved for known line drive guys or speed demons. And even those guys don't tend to keep that up for very long. There are two Nationals that are looking at a drop in BABIP and likely everything that comes with it - Yuney Escobar (.371) and Wilson Ramos (.368). If/when it does come it will hit these two pretty hard because they don't walk and haven't shown power this year (Wilson, what happened?). Lobaton (.500!) and Taylor (.390, even given speed that's high) should also see this come down. On the flip-side around .250 is as bad as an everyday player will get, though a slow slugger might find himself under that. Of course while the ceiling is pretty firm the floor is not. You can simply not be good enough for everyday play which is likely the case for Tyler Moore (.143) and Dan Uggla (.244). Werth (.227! Insert Jackee jokes here! Although really your take-away from 227 should be Regina King who's been great in several things most notably arguably my favorite show on TV ever SouthLAnd) and Zimm (.252) are likely to see improvements... if they are healthy. Going to the mound .250 to.325 is a decent range, though in this case the ceiling is the soft spot. Taking some history into account Strsasburg (.394) and Gio (.375) should see some better luck here. (Grace (.400), Barrett (.370)... that's your call). On the other hand no starters are getting overly lucky - Fister's on the edge but I'm just looking for sure things here. Thornton (.192) and Solis (.158) are the ones to watch so the recent decent pen stuff might be a bit of an oasis that the Nats are only temporarily stopped at. HR//FB% - The pure home run guys can close in on 30% but generally 25% is a good estimate of the top you'll see in the majors. 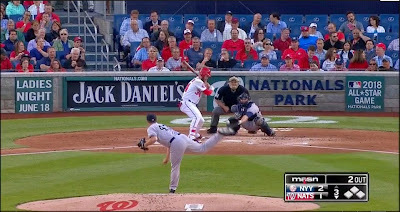 Nats don't really have a problem here as, well, they don't hit homers, but Bryce Harper's 32.7% is going to come down. Yeah sorry kids.Hhe's not hitting 50+ this year. He could still lead the league though. Again the floors in baseball for hitters are squishier than the ceilings, and some guys in the majors just don't hit homers. Still percentages in the low single digits are rare and we can be informed by history, so Werth (3.6%), Ramos (4.8%), Desmond (8.0%) should all see a bump in power - assuming they are healthy. For pitchers it's harder to pin this down but here's an odd stat. Barrett, Storen, Thornton, Grace, Solis and Treinen (yes Treinen) have yet to give up a home run. That's going to change. Strasburg (3.0%), ZNN (4.3%), Gio (5.0%) and Scherzer (5.3%) should all see some bump in that number too. But you can be pretty low - like in the 7-8% range so I'm not saying they'll blow up. RISP - For batters only. This is more about deviation from your nomal stats. Expect Ramos (.407), Uggla (.353), & Escobar (.348) to drive in fewer. Espinosa (.059), Desmond (.115), and Werth (.208) to drive in more. LOB% - This is just for the pitchers. Solis (100%) ain't this good, expect that luck to turn. Matt Grace (90%) is also too high and given everything else that makes me pretty worried about Grace being here very long. Thornton (44.4%) could stand to be luckier. ZNN (60.9%) should get better, as should Strasburg (65.3%) provided he's not hurt in someway. Is there a take-away here. Not particularly. We see a mix of bad luck and good luck which is what you expect to see. If you twist my arm I'd expect both the pitching and offense to go down a half-step but it could easily be the other way. Escobar and Ramos will cool down but the potential is there for Werth, Zimm, and Desmond to start hitting better at more timely times. The only thing that makes me say "half step down" is the fact Werth and Zimm might really be hurt as opposed to just catching bad luck. The starting pitching is mostly tweaks and might even get better. Again - this is a GREAT rotation. Oddly given how spotty it has been I see the relief pitching with the biggest bust potential. Although that's probably a function of the way this pen is made up. Since there are so few defined roles, guys who stink get moved down and or out quickly and hot hands are ridden out. I'd just worry a bit about the hands being used now taking a bit of a dip. (I really expected Treinen to be a bit unlucky - nope - just has stunk) So I'd bet overall that while the starting pitching will slightly improve we're going to get more bumps in the bullpen road. I had the Nats at 16-16 3.5 (maybe 2.5) from the Mets by today. Well they are better than that 17-15, but the Mets still have that 3.5 game lead. Again. That's what a fast start affords you. 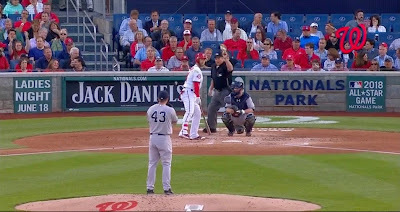 Still think the Nats are in a good place but they sit in an area where they don't have much of a cushion for bad play. Luckily they aren't a bad team, so bad play isn't likely. Outside of one random Phillies series this marks the end of the Nats NL East play until June 23rd. If they are going to keep up the winning play they are going to have to do it against the rest of the league. They'll start with the worst non NL East team they'll play for a month, in Arizona. After that it's a mix of solid teams. It'll be an interesting arguably defining stretch. 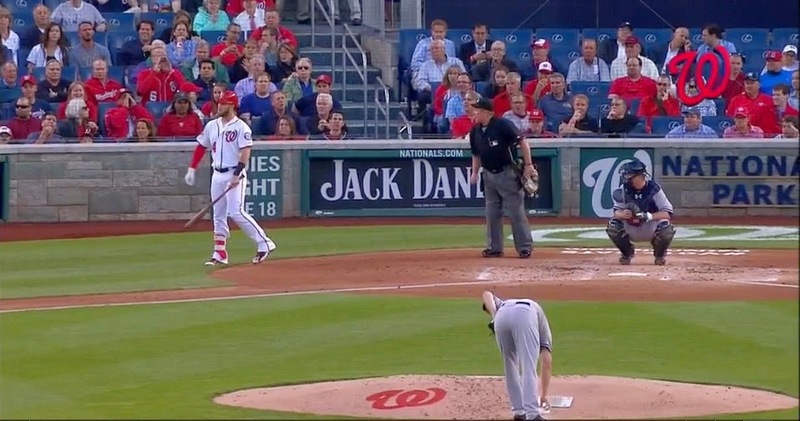 Bryce Harper spent the weekend turning a hot homer stretch into a "here's where he becomes BRYCE HARPER" which is fine because at 22 that's actually something you can say. That, if it continues, will go a long way to covering for the still MIA Werth and the MII Rendon. Did Tommy John change the trajectory of Strasburg's career? Yesterday I made a point on Twitter, repository of good points, that we shouldn't assume Strasburg "never came back" from Tommy John surgery* because he didn't pitch enough in the majors to give us a baseline. Of course it may be just as reasonable to argue the flipside then. We can't argue he did come back because we don't know where he started from. Where do the arguments come from? What ultimately makes most sense? Let's start with the base argument for the "never came back"ers. 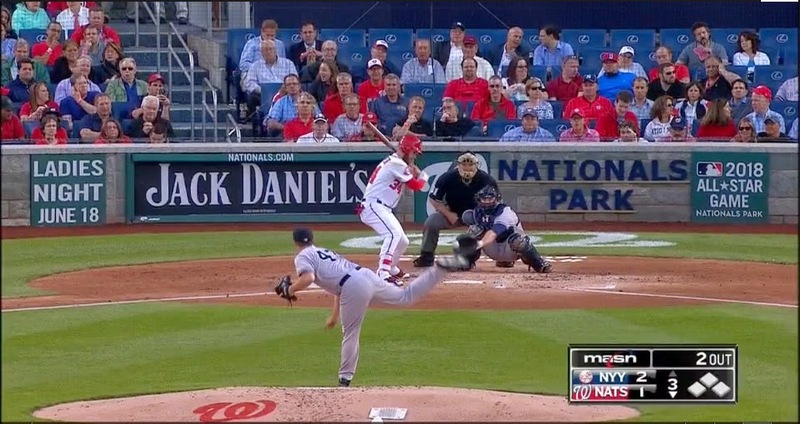 Before Tommy John surgery Strasburg was averaging 97.6 MPH on his fastball. After returning from the surgery he was averaging 96 MPH. The 1.5 MPH drop has to be explained by something. But that 97.6 MPH average was only done in 68 innings. Could it be an amped up rookie performing for the crowd? To answer that we need his minor league data.... that doesn't exist**. Even if we had his numbers it would be tough to say anything definitive with just that. It could be the case that he's more dominant in the minors which leads to fewer pitches thrown which leads to the ability to throw the pitches he does throw harder. Really what we need is ALL minor league data so we can see, based on age and minor league numbers, what we would expect a pitcher to do in the majors. Then we need to compare Strasburg's trajectory to the expected one and see if we can reasonably say TJ surgery threw him off. But all I'm doing now is going further down a rabbit hole with no rabbits. Doesn't exist. Oh well. What kind of comparison can we do? Well we could find any other young MLB stud starter that has averaged that level of fastball and see if they tailed off as much in the first two years. That would at least give us something. That ends up telling us something that might be pertinent. You see before last year, when Yordano Ventrua averaged 97 MPH even on his fastball - no one averaged faster than 96.1 MPH (as long as we have this data for which is like from 2001). And yet we're going in assuming Strasburg would average 97.6 for a season? That seems unreasonable. That 2010 Strasburg would be THAT much faster than anyone had ever thrown for a season? This seems to indicate that that 97.6 MPH number was simply unsustainable over the course of a major league season. Of course if Strasburg WAS special and could average a fastball that much faster than everyone else than that drop in velocity would be something. In general pitchers roughly stay close to peak velocity through their late 20s and don't see many drops as large as a 1.5 MPH in their early 20s. That would be unusual, if that's what you believe. What about monthly speeds in 2010? If those dropped then it would lead us to a similar conclusion. In fact, though, they DON'T drop. Strasburg averaged 98 MPH in June, 97.7 in July, and 98.1 in August. That's pretty consistent. Then again his IP per game was dropping quickly. In June it was 6 1/3. In July it 5 2/3rds. In August it was around 4.5 IP. Remember the minor league argument; fewer pitches means you can throw harder. What about his other pitches? Again there is too little major league data to be sure but it appears that the velocity drop was across the board but the movement on his pitches remained about the same. Or at least we can't claim from the data any significant changes. 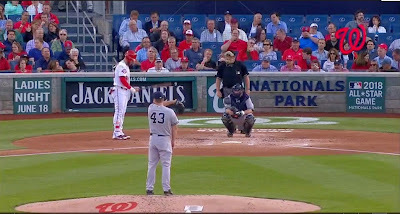 The exception may be his change-up, which went from a a very tight pitch with little vertical movement to one with noticeable vertical movement. Of course who's to say what's better and the pitch has remained effective. There are other things to think about to. Perhaps he could hit the same speed after surgery but was explicitly coached to take it down a notch. Perhaps he could have thrown that fast for a season but perhaps it was that speed that led to the injury. Maybe he had the talent but the physical tools just didn't exist for him (don't exist for anyone?) so the argument would be he would have always become the pitcher he is today. One thing to remember. I talk a lot about impressions and how fans feel about a player being shaped by key moments; his first few appearances, his work in big games. For all the sepia-toned nostalgia that goes with Strasburg's first season arguably his best two starts were his first and his third. After those two, super fast fastball or not, he would never go over 6 innings with a ton of K's and low runs given up again. (he had a handful of great starts that only lasted 6IP). The Strasburg you may remember, the dominant force that would shut down teams deep into games, never existed. *for those that don't run in the same Twitter circles this has been a theory slowly growing in popularity. ** Fall League numbers in 2009 do exist and he was up OVER 98 MPH but this was literally 120 pitches total. I have a hard time considering that comparable, so I don't think it should be used either as evidence that 97.6 MPH was reasonable for a season or evidence that his overall MPH was dropping. We could check vs other Fall League pitchers if you like. Strasburg - you want him on that mound. You need him on that mound. There are two way to look at the Nats situation right now. The optimist sees a team that has won 7 of 9 and made up 4 games on the division leading Mets. The pitching has looked stronger. The bullpen feels like it's working itself out. The offense has been a bit up and down but given the previous two sentences, "up and down" is enough to win more games then they lose. Ramos and Desmond are hitting and Bryce flashed again his team-carrying potential. They aren't where they want to be yet but they should be soon. The pessimist sees a team that put itself so far out of the lead early that going 7-2 while the division leader goes 3-5 still has the team out 4 games. Strasburg might be hurt. ZNN still doesn't have his fastball (neither does Fister). The bullpen is still shaky. The offense has yet to find any consistency. Zimm still isn't hitting, may be hurt. Werth still isn't hitting, may be hurt. Rendon still isn't playing, is hurt. It could be a long slog to where they want to be. Strasburg's injury is concerning. It could be just a minor thing. He obviously was pitching through it and he hasn't gotten out of routine yet. Maybe he just misses a start or not even that. However, just because you can pitch through it or it doesn't hurt too bad doesn't mean there isn't a bigger issue behind it. And if it's a shoulder issue... there goes the season. The cascade effect from something like that would be doubly painful. Part of the reason the pen feels to be gelling is the use of Tanner Roark in more critical situations. If he has to stretch out and take Stras' place in the rotation the bullpen is thrown into complete flux again. If you decide to keep him in the pen, well they thought AJ Cole was their best option and you saw how that went. Either way a hole is created just when we thought the Nats might have everything covered after 30 games of guessing. Keep your eye on this. The offense is going to be all over the place but if you were smart you knew that going in. It could be a very good offense if everyone was healthy but the Nats aren't a particularly healthy squad. So predicting health would be a big mistake. (In fact Span and Werth and Rendon (hell - and Yunel) were all hurt to start the year.) As injuries come and go and the normal streaks of an offense come into play there is going to be some real low times and some times when the offense looks championship caliber. You just have to accept it. I come down them some what in between the optimist and pessimist (booooo me! too waffley!). I start on the pessimist's side. The Nats had a good 10ish game run, the Mets had a mediocre one. The Mets still have a firm lead. That's the problem with digging a hole. The Nats can't go 7-3 while the Mets go 3-5 and have that be that. The Nats would have to go 14-6 while the Mets go 6-10 to close the gap. That's a bigger thing to ask for. The Nats aren't that good. The Mets certainly aren't that bad. Closing the gap will take more than a week. But will it be a long slog? It might but it doesn't have to be. That's up to timing. And really being out a series or so shouldn't feel that bad. As long as the Marlins and Braves kind of slip away I don't mind being 2-3 games out as far as the All-Star game. I think as long as you can keep yourself around that level you're always just one good week for you and one bad week for the other guy from being where you want to be. That'll happen at some point. The key is tempering your own performance and having the team you are chasing not get lucky and reel off another hot streak. The latter we can't do much about. We have to hope the Mets innate 85 win talent keeps that from happening again. The former, well the starting pitching should help avoid any really bad 10 game runs. Should - we've seen how that's a "should" in the first couple weeks. But "should" is better than "have no idea, let's hope really hard". Very few teams are "should". The Nats are. Sometimes kids have to go to dentists. But here's a place to erupt if something happens in today's game. Anthony Rendon, is now down with an oblique strain. What does that mean? What does THAT mean? What does that MEAN? What does THAT mean is that he hurt the muscles on the side of his abs. Much like the non-tear knee injury, there isn't an operation for it - you just wait it out for however long it takes. The mildest cases can take about a week or two, but they can linger and take 6 weeks or longer. Escobar had this kind of strain in the Spring. He was fine in his allotted time (as were Ellsbury and Pillar off the top of my head), but we don't know yet what level of strain Rendon has or if it's an interior or exterior muscle or I assume other things, I'm no doctor. If you're looking for the straight "most likely scenario" Give him about 4 weeks (from the last game played) to heal, another week to build up to playing again, and then at least a week of minor league play. That would give Rendon a ETA of June 12th, or about 60 games in. What does that mean is that Rendon is going to miss at least 40% of the season, if things go about typical from here on out and for Rendon "typical" might be optimistic. This means more Danny, Ian and Yuney line-ups. Losing Rendon is going to cost the Nats something - he was probably their most valuable player last year. But how much? Danny and Yuney have both been surprisingly decent this year. If the season ended today Yunel Escobar would have his best year since 2011 and Danny his best year ever. That alone should tell you this is probably unsustainable. (probably - Span managed to keep up his "best in years" season last year). What do the fancy stats say? What's propelling Danny is a radical drop in strikeout rate from 33.5% last year to 13.5% this year. His walk rate has also changed dramatically from 4.9% to 10.8%. The walk rate is less of a surprise. Danny has had a good eye in the past having a walk rate around 8.0% in the upper minors and first couple years in the majors. So a monthly jump to 10.8% is perfectly reasonable. That strike out rate though is worth investigating. He has NEVER struck out at such a low rate. Not in his best year, not in the lowest minor league levels. A strikeout is an automatic out. You have fewer of those you put more balls in play you get more hits. The average goes up, which we've seen. Is he swinging less at bad pitches? Yes. His O-Swing% (swings at pitches outside the zone) is down to 32.1% from a high of 42.7% in 2013. However that's about how much he was swinging at these pitches in his first couple seasons and he struck out a lot more. So it's not just that. Is he making more contact? Yes. His O-Contact% (you're smart. you can figure that out) and Z-Contact% (in the zone) are both up from recent years. The Z-Contact% especially would be the best of his career. We see the expected corresponding drop in SwingingStrike% down to 10.6% - again lowest of his career. Is he sacrificing power to make this happen? My guess is yes, (power is down from his peak year) but really it's too early to tell. It's not down from his 2nd best year but an errant HR could bump a monthly SLG up.We'll know better by the end of May. What about Yunel? He is seeing some luck - his .333 BABIP isn't a crazy number but it would be the highest he's seen for a full season (he had a .364 for half a year back when he was a 24 year old). So the expectation would be a bit of a drop in BABIP and in corresponding batting average. But it may not be as much as you think it could be. His flyball rate has dropped like a rock, under 18% down from the 25-30%. It hasn't gone into line drives, which would be the best thing, it's all gone into ground balls (up to 62.5% from around 50-55%) but when you don't have HR power GBs are better than FBs. Everything else is basically on line. That's a bit surprising, given the batted ball change. I wouldn't be shocked if his power drops a bit by the end of the year. Also his walk-rate keeps dropping but if he can keep the average up it's not too much of an issue. Given what I've seen now, Yunel should see a bit of an average drop maybe ending up in the .285 average with little patience or power, but that should be ok. Right around average offensive production which isn't great but fine enough given the gamble the Nats took on his injury causing long term issues. Danny? I don't know. If this is real he's a different and more useful player. But it's only been a month and he hasn't started everyday so the sample is small. I really don't know what to think, it's that dramatic a change. Getting back to the question at hand, they'll lose something with Rendon out but if Danny is NEW DANNY then it will only be a couple of games, rather than a handful. The talent this year can handle either, but obviously you'd rather it be fewer games than more. That's two seasons of healthy play in seven years. Yes, not all the injuries are comparable, but all the injuries are injuries. They happened. And even if you don't believe those early breaks will matter for future injury (I think they are "non-ignorable") these latter ones, muscle strains in his mid 20s, should concern you. It's nice that Danny and Yunel might be able to compensate for Rendon in 2015, but they aren't keys to keeping the Nats winning later in this decade. Rendon is. This takes away one thing you thought you might be sure about for those years. The 2015 Nats' expectations could really be boiled down to 5 phrases. Max Scherzer is better than your #1. 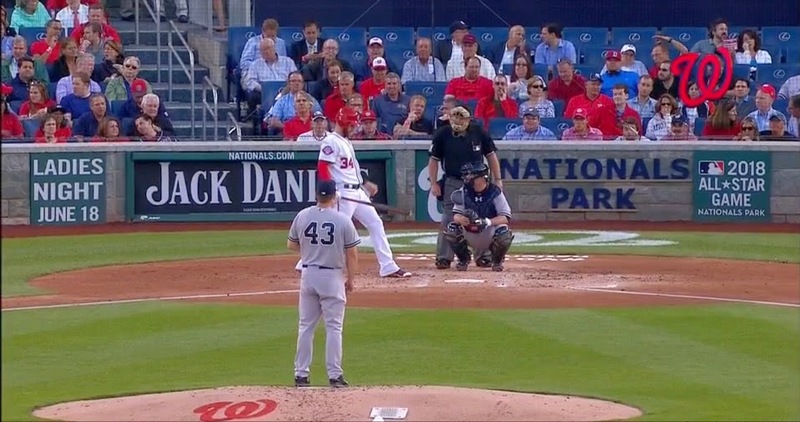 Jordan Zimmermann is better than your #2. 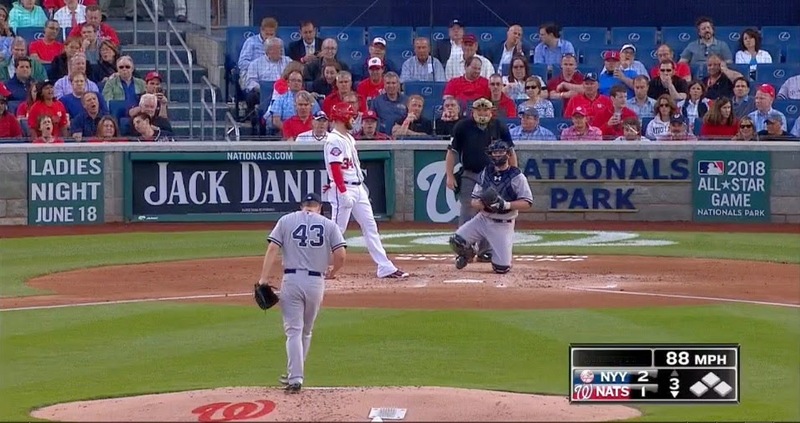 Stephen Strasburg is better than your #3. 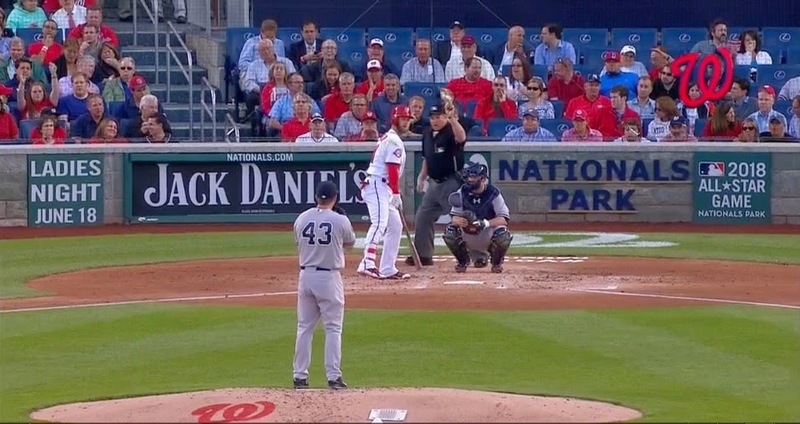 Gio Gonzalez is better than your #4. Doug Fister is better than your #5. Two 1-0 wins in a row is the stamp on a a great turn in the rotation by the Nats starters. Three dominant performances, one good but short one, and a decent 7 inning start. Maybe you wouldn't immediately match the pitcher to the performance but who cares? Each starter the Nats have is capable of having dominant performances. Should you be concerned about the offense? Sure. This facsimile of Jayson Werth is hideous. Yunel Escobar, who was "so great" had one bad week and is back to being below average. Anthony Rendon may one day play back to back games. But with that starting staff (and a bullpen that hopefully finally realizes Blake Treinen is not your big pressure guy) you don't need a great offense. You don't even need a good offense. You can get away with an average offense and I think the Nats can easily hit that mark. The important games aren't over with the Mets series though. Now the Nats have a homestand versus Miami and Atlanta. The Marlins are coming along. The Braves are trying to hang on. Both are a half game ahead of the Nats right now. A double series win would bring the Nats to .500, and likely put both of those squads in the rear-view. Any sort of middling performance or worse and the Nats are back playing catch-up to most of the NL East. Give enough teams, enough time and enough of a lead and someone will run away from you. You've had it rough recently losing 3 in a row, and 5 of your last 7, losing series to the Yankees, who you want to beat, and the Marlins, who you want to beat, and the first game of a home series with the Nationals, who you want to beat. Meanwhile the Marlins have won 7 of their last 8 and the Nationals have won three in a row scoring 33 runs. You were hoping the Marlins were really secretly bad. You were hoping the Nationals were digging themselves a giant hole. Those hopes are fading. If the Nationals beat you tonight and the Marlins win, you'll barely be a series ahead of your biggest competitors when you started the week more than two series ahead. You'll have just lost games started by your two best pitchers. Don't get too high. Don't get too low. Take the macro view. What does that tell us? Let's take stock. The Marlins, challenger #2, are a half-game ahead. The offense is predictably carrying the team but it still doesn't seem to be all there yet. While Dee Gordon is likely to dip, there is more underperformance than over. Yelich is out with an injury. Morse, Prado, Saltamacchia, and Ozuna all should show some degree of improvement. (Though perhaps there are things I don't know about.) The pitching staff though is not good. It could get better. Cosart has flashes of being real good. Jose Fernandez will be back at some point. But it also couldn't. Mat Latos hasn't looked good and Dan Haren can't help but give up long fly balls. Outside of the NL West that's an issue. The pen is a mess except for a couple arms. They are a question mark, with the ability to catch fire or to sputter and go out. The Nationals are healthier but not healthy, with some issues that we're hoping, but aren't entirely sure, will clear up soon.With the outburst in the last few games the Nats have moved up the offensive ranks to 2nd in the NL. The good news is Bryce might have turned the corner and Span, if he can stay healthy, doesn't seem a strong candidate for decline in comparison to last year. But there are likely unsustainable performances from Espinosa and Escobar carrying them as well. Desmond should improve at least somewhat but the question is whether or not the underperformances of Werth, Ramos, and Zimmerman are long-term issues or not. If so even the return of a healthy Rendon won't keep this offense from being closer to average. The pitching staff issues are more of a worry. Strasburg, Gio, and ZNN all have yet to shake off an early season funk and Fister is pushing his luck even further. The bullpen went through a real rough patch that hasn't fully cleared up. Unlike the Marlins there isn't real fizzle potential here. Neither the pitching staff or offense should be terrible,** even if they underperform, but there is a question of whether everything comes together to make them the predicted unstoppable force or if they never quite get healthy enough and spend the year taking three steps back for every four steps foward. Based on the above worry is still around but a nice strong 6 game winning streak including sweeping the Mets would clear a lot of that right up, especially if Werth and Ramos' bats heat up and we hear good news about Rendon and Janssen. We're on the cusp of it coming together. Will it? *they also have Syndergaard and injury returning D'Arnaud as potential mid-season game changers. Which makes it important for the Nats to take this series while the Mets are playing poorly and not at full strength.